It was this amazing book that introduced me to the zappy world of zappos.com a long time ago. What interested me was their ingenuity and ‘courage’ to make something as counter-intuitive (at first look) as selling footwear through the Internet happen. I mean, the very model of shoe buying starts with you going over to the store to try out footwear for yourself and see if it fits your size, shape, style etc. Right? So how on earth do you think you could replace this ‘last mile’ experience at the shoe store and go about selling shoes through the Internet like selling books or airline tickets? Tony Hsieh and his team at Zappos did it and did so through a journey of spirited entrepreneurship, passion, innovation and a purpose. Zappos didn’t just sell shoes, it did so with incredible profitability that Amazon had to think of acquiring zappos. And but out, they did for nearly 1 Billion USD. Despite this acquisition, Zappos still operates seeped in its own unique culture, cult and legend that’s been written about in a number of books. Another retail concept that is extremely dependent upon the consumer trying out stuff physically and in person before making a purchase is the optical store. Just as trying out shoes is essential before making a purchase, trying out spectacles in person is ofcourse mandatory. The shape of the frame, the color, the weight and ofcourse the style need to be tried out before making the purchase. Added to this is the complication of the lens – the choice in them, the brands in them, the technical intricacies and finally the actual vision correction. So do you think we can replace all this fuss at the actual optical store with an e-commerce channel? Sounds almost heretical, isn’t it? WarbyParker (WP) does it. It sells cool, stylish, high quality prescription glasses at just 95 $! Read here on how they do it. Profiled in Springwise, Bloomberg Businessweek, Inc, Fastcompany etc, the startup called Warby Parker (nearly 2 years ago) was founded by 4 Wharton grads, ”with a rebellious spirit and a lofty objective: to create boutique-quality, classically crafted eyewear at a revolutionary price point”.WP’s website is clearly designed with a meticulous attention to detail, consumer requirements, their typical concerns and their worst nightmares when it comes to chosing the right pair of glasses. At WP, the whole experience of choosing and ordering a pair of specs is so streamlined and smooth, it just feels almost as a no brainer like buying an airticket albeit for your long awaited dream vacation! It asks for some basic attributes like, shape of your face (and also helps you out of you are unsure! ), color preference and goes about populating your screen with it’s recommended models. And not just that, once you chose a likely frame, it gives you an option to upload your image or take your picture with your webcam so that it can overlay that with the frame that you have chosen! 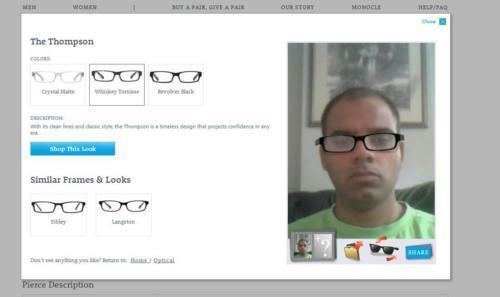 Not very convinced, just click on any other pair, you would see yourself wearing those glasses in a few secs! There are so many noteworthy facets about WP including a cool way of using infographics to share its ‘annual report’, it’s home try-on program, its do good initiative etc that it is hardly surprising to see its copy cats spawned up in a very short span of time! And now WP is ranked among the top 10 most innovative companies of 2012 by Fastcompany. – These companies tried the nearly impossible to start with. -They were willing to question the obvious with an incredible amount of attention to detail to customer service. They understood (and continuously seek to understand) their consumers and their pinch points while making the purchase. -And lastly they have a purpose that is beyond just profits and dividends. Any other examples where we have seen a disruption of the traditional model by an e-retail concept? This entry was posted in Uncategorized and tagged Fastcompany, Most Innovative Companies, Warby Parker, Zappos. Bookmark the permalink.